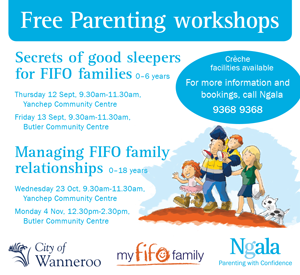 My Fifo Family is teaming up with City of Wanneroo and Ngala to present a series of Parenting Workshops focusing on Fifo Families. For more information and bookings contact Ngala on 3968 9368. Don’t miss out on these helpful & informative sessions!